A new survey suggests that people in higher positions in the workplace are more likely to see work meals, widely known as ‘hoesik’ in South Korea, as necessary. According to a recent survey conducted by Job Korea targeting 230 Korean employees, over 73 percent of the respondents said hoesik felt like overtime work. While the majority of respondents said the ideal number of work meals was one per month, the findings showed a gap in opinions between those in higher positions and their juniors. Nearly 30 percent of workers holding a position higher than department head said work meals were “necessary,” while 31 percent of regular staff members and 29 percent of deputy section chiefs or the equivalent said they were not. Over half of respondents said they were at liberty to avoid work meals despite feeling slightly pressured, while just below 30 percent said they were free to make their own decisions. Only around 19 percent said they felt compelled to go, the survey showed. 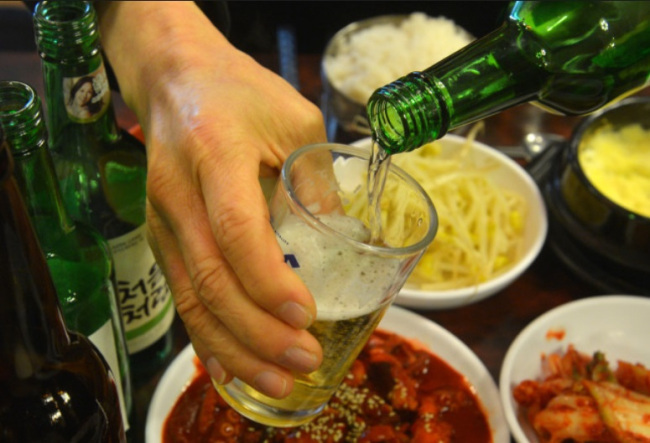 Despite their notoriety, hoesik could soon be heading for the exit ramp as a growing number of Koreans are finishing their dinners earlier than before. A study by Shinhan Card last month revealed that the volume of credit card transactions at restaurants was at its peak between 7 p.m. and 8 p.m. this year, accounting for 26.1 percent. The most popular time frame for dining out has moved counterclockwise over the years, as the peak hour for credit card payments at restaurants in 2012 was 8 to 9 p.m.
“Compared with the earlier drinking culture that used to last into the late hours, society’s attitude of encouraging going home early and spending one’s free time on one’s own might have played a role (in advancing the dinner hour),” the company said. A further look at the report shows that workers in their 40s had led the charge, while the shift in peak dinner hours was most significant among office workers.